So after reading about CSA (community supported agriculture) or A food guild on other food blogs I decided I should sign up. There's a little icon on the left hand side of the blog, to locate yours. in Booneville NC, and I can pick up the veggies on thursday at my local whole foods, how cool is that! 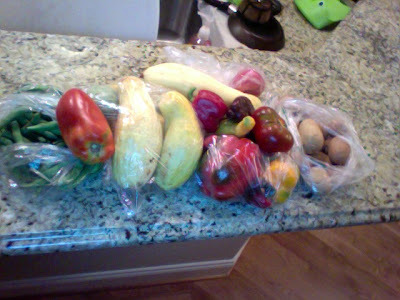 So today I got tomatoes, peppers, potatoes, green beans and squash. My Mum and Dad in Law are coming from India tomorrow, I know she will love it, so we will look forward to what we can make together. It works out to be $28 a week so not bad. where you can list your blogs and find great recipes, looks like a great site done by one of the founders of blog catalog. The vegetables look great! I love getting fresh ingredients from a farm. I'd like to sign up for a CSA, but my husband and I work a lot and I'm afraid most of the food would go bad. So, I just buy what I need. You are so lucky to live in the western part of NC where organic veggies abound and wonderful grass-fed beef and pork and free-range chickens. We in the east have all that, but without competition. My son lives in Asheville (17 farmers markets and 135 independent restaurants, and the best food just about anywhere)and he's always telling me about the wonderful organic and natural foods available there. Beautiful veggies! I love my box--although it doesn't have quite the variety of yours. It forces me to be creative and it is a good deal for organic, local produce here. Wow, fresh organic veggies at $28 a week is so cool! This amount of money cannot even buy organic veggies for a day's meal in HK. Joining a CSA is a great idea! I wish more folks supported their local farmers. Enjoy your time with your in-laws!